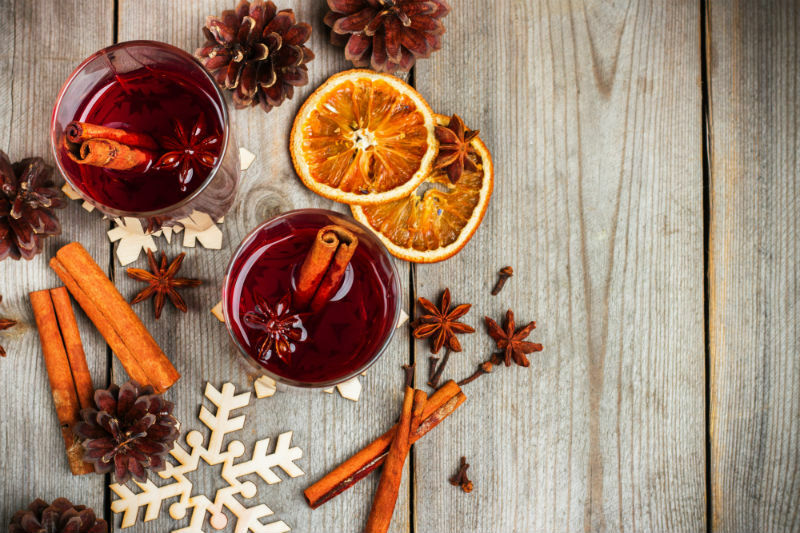 There’s nothing like the warming spice of a mulled wine to get you into the Christmas spirit. And our simple recipe is made up of the classic flavours. Aromatic and comforting, it’s the perfect end to a long winter’s day. We recommend using a red wine with a reasonably high alcohol content and fruity tones that will complement the spices. A Shiraz or Merlot is perfect. In this recipe we’ve chosen to add brandy for a traditional flavour, but you can add sloe gin for an extra fruity kick, or port if you want a richer batch. Check out our sloe gin recipe if you fancy making your own. When the whole family is round, get this simmering on the stove, ready to serve up and get the festivities flowing. Slice one of your oranges in half and slice your vanilla pod in half lengthways. Add all your ingredients, apart from the brandy and your whole orange to a large saucepan. Gently simmer until all of the sugar has dissolved into the mixture, stirring occasionally. Avoid bringing to the boil as this will burn off the alcohol. Once your sugar has dissolved, taste your mulled wine, and if you would prefer it sweeter then add more sugar and stir until dissolved again. Add in the brandy and stir, you can add more if you prefer a stronger flavour. Take your wine off the heat. Cut the second orange into half moon segments. Serve your mulled wine in heat resistant glasses, and add your orange segment as garnish and for extra orange flavour. If you prefer, you can pour your mulled wine through a strainer to take out any of the bits that are in the mixture from the spices. For more Christmas ideas, check out our guide to The Perfect Cheeseboard, or find out how to put together the Best Christmas Hamper. Find us on Facebook @HomeChefUK and let us know your secret tips to make the ultimate mulled wine.